Ever since the debut of the American television show The Office, Hollywood has fallen in love with Rainn Wilson. The character of Dwight Schrute that Wilson plays on The Office is one of the funniest characters television has seen in a long time. However, Wilson plays Dwight straight, he is funny because of how bizarre he is. In The Rocker Wilson is asked to give your typical comedic performance, something like Will Ferrell would do. I’m not say Will Ferrell would have faired any better since The Rocker follows the basic Hollywood formula. Since comedies are usually rated by how many laughs they get, and The Rocker has a few good laughs, but not enough; I would have to say The Rocker is at the least bearable. In The Rocker, Robert 'Fish' Fishman (Rainn Wilson) is the drummer of the band Vesuvius. Right before the band is about to make it big, Fish is let go from the band. Fish spends the next twenty years roaming around never real getting anywhere in live. After getting fired from his job at a call center and losing his girlfriend, he moves in with his sister. Conveniently for him, his nephew Matt (Josh Gad) has a band, A.D.D, in need of a drummer. The rest of the band members, Amelia (Emma Stone) and Curtis (Teddy Geiger), are reluctant to let such an old person into the band. You can probably guess what happens next. A.D.D makes it big and Fish is set on a course to confront his past ghosts: the members of Vesuvius. The Rocker has a good cast including Christina Applegate who plays Kim. Christina plays Curtis mom and develops a friendly relationship with Fish. None of the cast gives an above average performance expect for a supporting character played by Jeff Garlin who plays Stan, Fish’s brother in law. Jeff Garlin plays Larry David’s agent in the show Curb Your Enthusiasm, and he hilarious both on the show and in The Rocker. A cast member that real bother me was Josh Gad, he’s like a poor man’s Jonah Hill and every time I would see him I would think: this movie would be so much better with Jonah playing his part. While the movie has it moments and is fairly entertaining, I felt it was about twenty minutes too long. Also, I don’t think this is the type of movie Rainn Wilson should be doing. The writing is just not there. When you sit down to write a comedy you have to remember to make it funny. You just can’t seat back hire a talent like Rainn Wilson and think he can make the material funny by making funny expression. The Rocker didn’t do to well in the box-office, however, Fox has loaded the Blu-ray “Born To Rock” with a bunch of features. The movie is presented in 1080P anamorphic widescreen and looks great for this type of movie. The colors are vibrant and artifacts are nonexistence. The audio presented in 5.1 DTS-HD, is pristine and those who like this type of music will be very pleased with the quality. 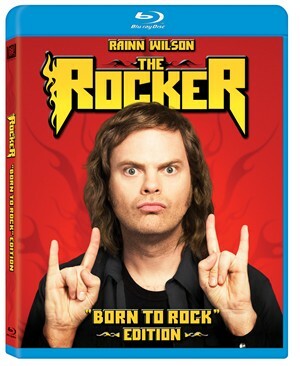 The “Born To Rock” edition also includes a digital copy of the movie for portable media players, commentary with director Peter Cattaneo and actor Rainn Wilson, commentary with actors Josh Gad, Teddy Geiger, Emma Stone and Jason Sudeikis, 10 Deleted Scenes, Gag Reel (including separate options of “Matt Gags” and “Vesuvius Gags”), Rainn Wilson: Office Rocker featurette, Pete Best Interview featurette, Behind The Band: Vesuvius featurette, Rock Beat With Fish Fishman featurette, The Music of The Rocker featurette, Rock Tales featurette, MTV Film Festival Panel, Fox Movie Channel Presents: In Character With The Rocker, “I’m Not Bitter” music video, Four exclusive pod casts and a Vesuvius Public Service Announcements. I spent about two hours going through the feature. If you are a fan of The Rocker the “Born To Rock” edition is for you. Deleted Scenes - 10 deleted scenes where the last one is sort of an alternative ending. One delete scene shows Fish and Pete Best who The Rocker is sort of based on. Gag Reel - Ten minutes of gags are presented here for those of you that like these sort of things.